District Health & Family Welfare Samiti Uttar Dinajpur Officially released DHFWS Dinajpur Recruitment 2019 Notification. According to the information in the Notification, there are 32 Social Worker (National Tobacco Control Programme NTCP), GNM (NRC), Medical Officer, GDMO, Specialist, Senior Medical Officer, Kala-Azar Technical Supervisor (KTS under NVBDCP) Positions available. Well, for these Vacancies, District Health & Family Welfare Samiti Uttar Dinajpur Officials are going to conduct the Walkin. Now, the Candidates can go ahead and check the total information given in the DHFWS Dinajpur Recruitment 2019 Notification. And then if they are eligible, and have had all the Qualifications, then they can attend for the Walkin. 27th February 2019 is the Walkin Date. Through this post, we are going to share the total information given in the DHFWS Dinajpur Recruitment 2019 Notification. Now, interested Candidates can even get the total update about the DHFWS Uttar Dinajpur Medical Officer Recruitment 2019. Now, in the above section, candidates can even find a table. And that table is going to provide enough information about the DHFWS Dinajpur Recruitment 2019 Notification. GNM (NRC) B.Sc nursing course / GNM training Course. GDMO (National Health Mission – NHM) MBBS and Must be registered under West Bengal Medical Council. Specialist (O&G) Post Graduate Degree / Diploma in the discipline of G & O. Specialist (Anesthetists) Post Graduate Degree / Diploma in the discipline of Anesthesiology. Senior Medical Officer (ART) MD in medicine or any other clinical discipline. Medical Officer (ART) MBBS trained by NACO at one of the NACO designated training centers. Candidates visit the District Health & Family Welfare Samiti Uttar Dinajpur official web portal @ uttardinajpur.nic.in. 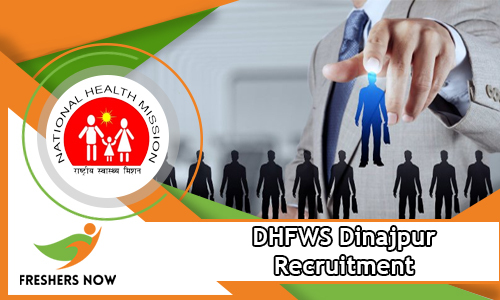 Now, you have to see the DHFWS Dinajpur Recruitment 2019 Notification link on the Recruitment Page. If you are eligible for any one of the Posts then attend for the Walkin interview, on mentioned date, to the following address along with all your Documents. Stay tuned to our web page Freshers Now or the official web portal of the District Health & Family Welfare Samiti Uttar Dinajpur to know more information about DHFWS Dinajpur Recruitment 2019 Notification.